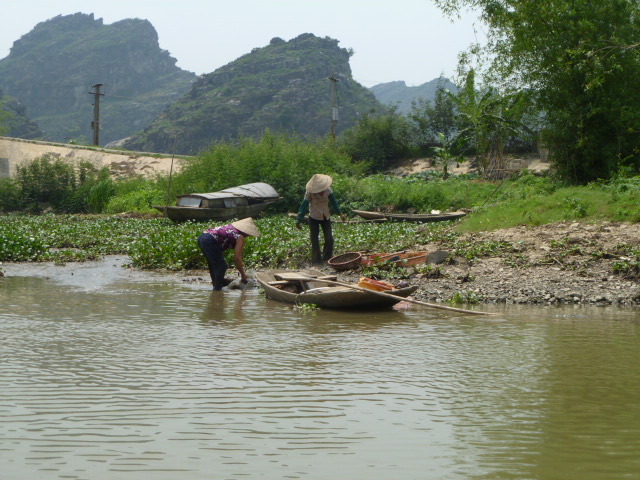 The countryside surrounding Ninh Binh just might end up being one of the places I’ve enjoyed the most here in Vietnam. Everything about it was just what I love – gorgeous nature, peace and quiet, few other tourists, moving water, and easy access for boating around the sights. 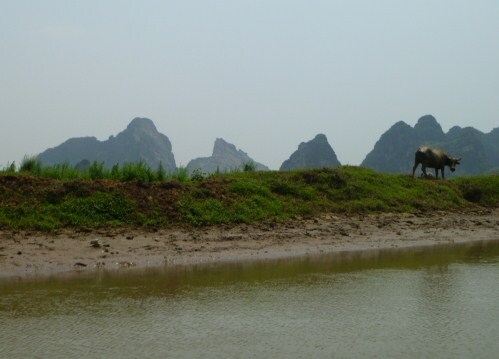 In addition to doing that at Trang An and Tam Coc, I also spent a day in the stunning area of Van Long Nature Reserve and Ken Gha. Ken Gha was the first stop on my motorbike (I’ve certainly developed quite a comfort on them since my early days in southern Lao when I was still too green on the trip to even venture out on my own.). The way there was amazing – once I was out of the hustle-bustle city, I rode on a narrow paved road (that made way to a dirt road at times) with few other vehicles except for waving school children on their bicycles. Waving? Ohyes, waving. All it takes is for one of the local people to see me, especially, but not only the children. Then the wave of waves begins. They all start exclaiming “hello! hello!” with their hands wildly gesticulating as if battery powered. And they don’t stop waving until we are long past each other. I always return their enthusiasm with a bright smile. I found my way to Ken Gha, although signage in this country leaves a lot to be desired (read: non-existent), which has made for getting lost every single time I ventured out on my own. I saw a few boats in the river and that gave me a clue that I was in the right place. Not a tourist in sight. A lone man appeared and he figured out that I was here for a boat ride. 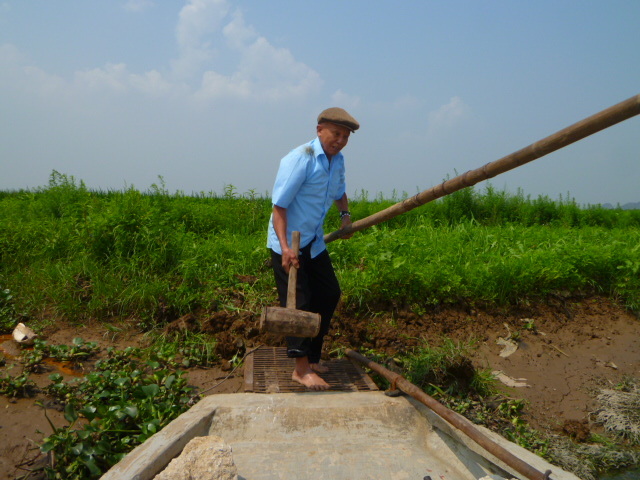 No sooner, the boatman arrived and I followed him down to the river and waiting boat. 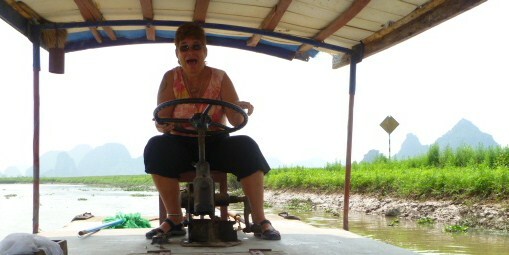 This time, unlike all the others, it was a motorized boat; just like what the man at the hotel told me to get, because the way down the river was long. The boatman was an older man, his brown skin weathered and worn by age; and he wore a bright smile as he moved about the boat preparing for our departure. I longed to be able to communicate with him, to hear his story, to learn just a little bit of what his eyes had seen. Alas, it wasn’t to be. 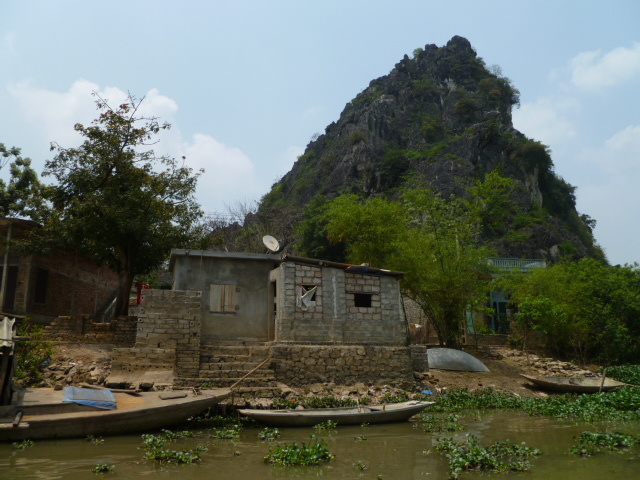 The sights captivated me – we came upon a small, floating village of simple brick homes and corner markets, the backdrop of more limestone formations, the ubiquitous rice paddies and a clear blue sky. People went about their lives – bathing in the river, fishing, washing clothes, farming and moving through the simplicity of their day. I tried to imagine, from where I sit and live, what their lives could possibly be like, such a far cry from anything I’ve every known. Again, not a tourist in sight and the only other boats were of local people floating their way down the river. As we headed toward the end of the trip, the man spoke to me for the first time – unintelligible to me, but he pointed at the steering wheel and at me. “Huh? You want me to drive the boat?”, I asked incredulously? He too didn’t understand a word but it seems that’s exactly what he was inferring. 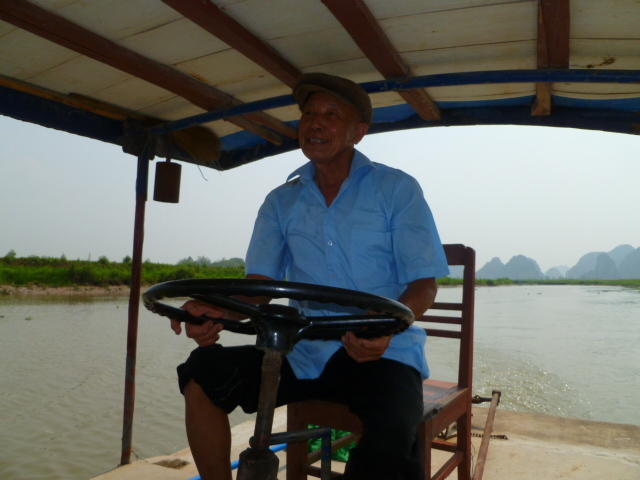 Ohmigod, okay, I agreed – I like to do almost everything the local people encourage me to do; so I hopped up to the wheel and took command as he headed toward the front of the boat. What a mistake! He grabbed my camera and got into position to take my picture. Oh, okay, now I understood, he wanted to take my picture. But in no time (and before he could snap the photo), as I ferociously tried to keep the boat going directly down river, I headed instead straight for the shore as I helplessly screamed my head off. He looked up, looked over at the land which was coming at us at a fever pitch; and while he made a mad dash to take over the wheel, it was too late. Way too late. I had run the boat directly and deeply into the riverbank! And there we sat, stuck in the mud as I kept exclaiming, “ohmigod, ohmigod, I’m so sorry!” The smile that had been glued to his face since we began our river journey vanished quickly and he moved into action to extricate my crash landing. 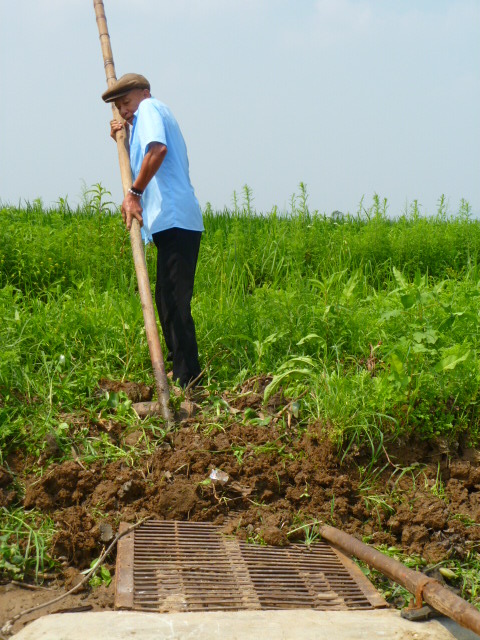 It was no small feat; after trying to reverse the boat (no luck), he went down into the engine compartment and came up with a huge wooden mallet and shovel to begin the digging out process. He rolled up his pants, climbed into the water and went ashore, his legs quickly enveloped in mud almost up to his knees! I felt compelled to join in to help, especially since I had caused this calamity; but not quite compelled enough to get past the prospect and my resistance of being knee deep in the muddy, mucky mess. I stood by at the bow, somewhat guiltily, with the audacity to take photos as he labored, but wordlessly cheering him on. What a task! He dug and pounded and dug and pounded until finally, his laborious, half-hour efforts extricated us. Then he climbed back aboard, put his hands into a prayer position, looked up to the heavens and smiled. And he didn’t seem to be too angry with my inferior boating skills, but I imagined he would reconsider the idea of having one of these zany tourists take the wheel again. Not true. In no time, again he suggested that I hop up and steer. “Ohno, you can’t be serious!” Is this guy a masochist, or what? But he was. Serious, that is; I can really say about the masochist part. Clearly, I had to comply. And again he grabbed my camera, determined to get a shot of me behind the wheel. But as soon as I heard the shutter release, I screamed for him to come back into command position and he seemed only too eager to oblige. Some kind of captain, me! Relief to have the all-smiles 'real' Captain back in charge again! Mission Accomplished! 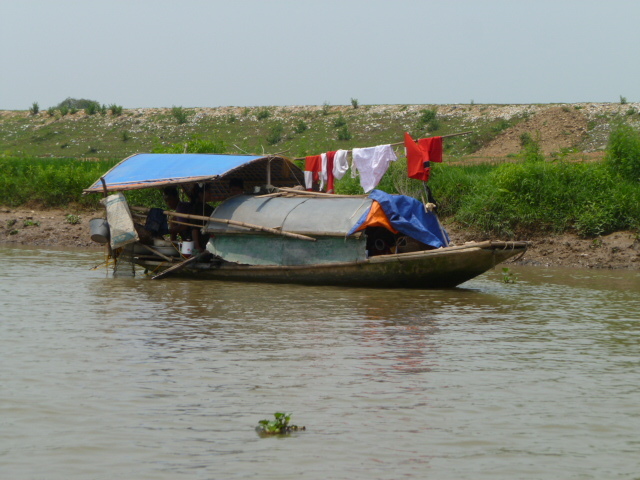 The photo was taken and we were headed back down river, far and safely away from the riverbank. We said our goodbyes, I gave him a well-earned tip, hopped back on my motorbike and laughed most all the way toward my next stop at the Van Long Nature Reserve! What a story! And what a nice, patient captain! I love the picture, dear! I love this and I love that you are motor-biking all over the place and I love this man’s face and I love the crash scene…! Very fun story!! M.